I invite you on a virtual tour of the Depression-era Soviet Union, in part through the eyes of Canadians who traveled there and, in part, through my eyes as I attempted to retrace some of their steps during a trip to Russia in 2014. In a series of posts over coming months, I’ll try to point out some of the sights they saw, look at what remains of them today, and what they might signify now a generation after the fall of communism. I’m sure that Bethune’s observation above, made at a speaking engagement after his return from the Soviet Union in 1935, applies to me. I have not spent sufficient time in self-reflection – or, as a Canadian Communist studying at the International Lenin School in the 1930s would have had it, engaged in an exercise of self-criticism – to discern exactly what my travels in search of Canadian interwar visitors to the Soviet Union unwittingly discloses about myself. Certainly, this ongoing journey has been a more complicated one than I imagined at its outset. Studying Canadians who visited the USSR in the 1930s leads an historian across a broad sweep of Canadian society. Canadian visitors to the Soviet Union, who were far more numerous than I had anticipated, came from across the country, from farm and city. Some were rich and others poor. In age they ranged from high school students to retirees. They were men and women, reverends, rabbis, and atheists, and members of every political party. These diverse travellers visited the USSR for similarly diverse reasons, creating sharp difference in their field of vision. This virtual tour will bring us in contact with a fair number of them, from well-known figures such as Bethune, Agnes Macphail, Frederick Banting, and Hugh Maclennan to those whose lives are now more obscure in the historical record. What did they hope to find in the Soviet Union and what did they find when they arrived there? The travelogues discussed in these posts – describing to Canadians the sites we will see on our virtual tour – were part of a public debate about the Soviet Union that was hotly contested in Canada over the course of the 1930s. Attitudes towards the USSR were a political litmus and its perceived successes or failures were deployed as weapons, left against right, right against left, left against left, and even right against right in those instances when some business interests favoured Soviet trade against those who were threatened by it. A. Grant is very civil and reserved, no exclamations, no emotional excitement, which are so common for tourists. He takes notes during his visits of each site, rarely asks questions and is reservedly inquisitive. Ellen Gentry is against the USSR. She is bored with objects/visited sites, not attentive. She is sarcastic about our reconstruction. She sang God save the King and hymns: she sang defiantly. Gregory Vlastos is smart, sly, educated, widely-read. He asks more questions than anyone else. Does not believe in what is shown to him. Looks for refutations of offered explanations; tries to confuse those who answer his questions with his recurrent questions. Verna Vlastos repeats her husband’s questions. Rosa Terlin listens silently, visits all the sites because she will need to tell at home that she has seen what others have seen. Fay Allan is talkative, flatters everything she saw. She hardly sympathizes with the Soviet Union. These comments are hardly unbiased – VOKS guides tended to protect themselves in advance from being blamed for a critical travelogue about the Soviet that a less-than-sympathetic visitor might write upon return home – but they do give a contemporary account of visitors’ behaviour and first impressions. Was Ellen Gentry, singing defiantly, a more typical Canadian visitor than the civil Grant? The records I could locate are not comprehensive enough to draw conclusions of this kind. They are nonetheless useful when they can be correlated against retrospective travelogues in Canada and to the degree that they illustrate a range of responses to Soviet hospitality. I will confess that during my ten days in Moscow it was outside of the archive’s operating hours that I felt closest to the visitors I was studying. I imagined myself sharing something of their experience, a tourist myself, limited by language, counting my rubles, fumbling along in the midst of a foreign culture. I was well aware that I was imperfectly following in their footsteps. I took a photograph that seemed like a metaphor for my search for them. They were off on the far right, out of my sight, looking up at the 1937 Soviet Pavilion with the statue of the young workers holding aloft the hammer and sickle, and here I was behind a barrier, with a distant glimpse of what they might have seen but needing to overlook the dumpsters and the McDonald’s between us. 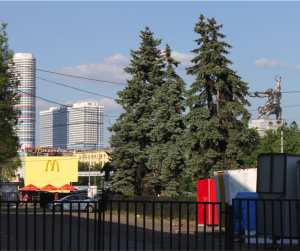 Nevertheless, I went to many of the sites within Moscow that were typical of the tours Canadians went on. Unlike me, interwar visitors did not confine their travels to Moscow. Universally they travelled more broadly in the Soviet Union, some quite extensively so, but Moscow featured in every visit I have uncovered. 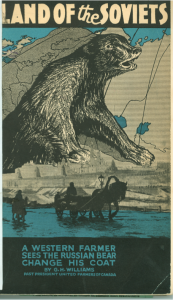 George H. Williams, The Land of the Soviets: A Western Farmer Sees The Russian Bear Change his Coat (Saskatoon: United Farmers of Canada, 1931), 13.